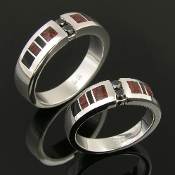 Dinosaur bone wedding ring sets are perfect for couples looking for a non-traditional symbol of their love. Dinosaur bone wedding rings are as unique as you are and guarantee your rings will set you apart from the plain band crowd. 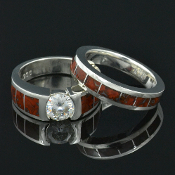 We offer our dinosaur bone wedding rings in matching his and hers, his and his and hers and hers ring sets. 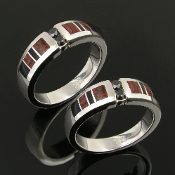 All of our rings may be customized by substituting the red dinosaur bone for gray bone or gray for the red. 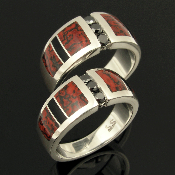 You may also mix and match colors and ring styles to create your own unique dinosaur bone wedding set. 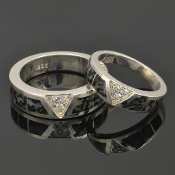 All of our dinosaur bone wedding rings are available in sterling silver, Continuum sterling silver, 14 karat gold and platinum. 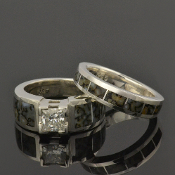 Contact us with your ring sizes for a price quote. 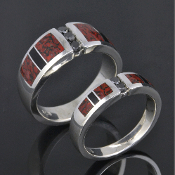 Your new dinosaur bone wedding rings will be made to order in your ring sizes in 4 to 6 weeks. 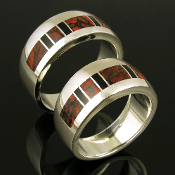 We offer many different dinosaur bone color options for our wedding ring sets, Some of the colors available are red, red-orange, blue, pinks, browns, grays and whites with a variety of different cell structures. 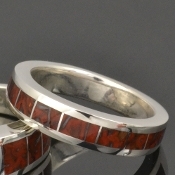 Every piece of dinosaur bone is unique and varies slightly from cut to cut and stone to stone, making your dinosaur bone ring a virtual one of a kind treasure. To see photos of the all the dinosaur bone colors we offer, please visit our Flickr page and check out our dinosaur bone jewelry photo collection.